• Accepts optional 3" (76 mm) diameter Diamond Cut-Off Wheels with 3/8" (10 mm) diameter center hole. 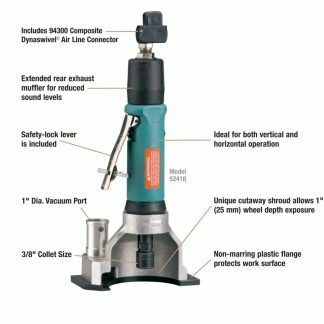 • Ideal for cutting thick fiberglass over-wrap and fiber spray. • Dual-wick lubrication system saturates gears with oil for increased performance, extended life and reduced downtime (following proper maintenance procedures). Tool includes 95848 Gear Oil and 95541 Gear Oil Gun. • Safety-lock lever is included; rear exhaust. 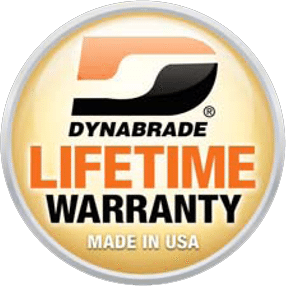 The Dynabrade 52439 3" (76 mm) Dia. Right Angle Diamond Cut-Off Wheel Tool, Non-Vacuum is a Dynabrade tool within the Cut-Off Wheel Tool category of tooling range. Cut-Off Wheels of 76mm can be used which can also be supplied by DynaShop. A Non-Vacuum tool with a maximum RPM of 12000, a power rating (hp/W) of 0.4 (298) with a weight of 1kg. Please complete the form below to arrange a tool demonstration for the Dynabrade 52439 3" (76 mm) Dia. Right Angle Diamond Cut-Off Wheel Tool, Non-Vacuum or any of the Dynabrade range of tooling. Alternatively please call us on 01273 468736.